Prepare noodles by following instructions on packet. Blanch the Kai Lan in boiling water (the length of time depends on thickness of stem). Drain and leave on side. 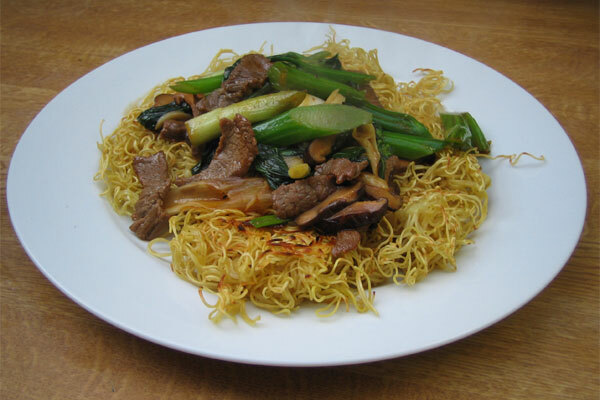 Heat 1 tablespoon of the groundnut oil in wok, stir fry noodles and soy sauce for 2 minutes, then remove from wok. Heat remaining oil in wok, stir-fry garlic and steak. Stir Kai Lan, oyster sauce, blended cornflour and water, Chinese wine vinegar and sugar, stir-fry until mixture boils and thickens. Serve Kai Lan mixture over noodles sprinkled with chillies. Asian Broccoli, Chinese Kale, Jie Lan, Gai Lan and leaf broccoli.